This Page shows how you set security permission for a module on a specific system. A permission represents access to a system resource. In order for a resource access to be allowed for an applet (or an application running with a security manager), the corresponding permission must be explicitly granted to the code attempting the access. In this, the target name is " /tmp/abc " and the action string is " read ". 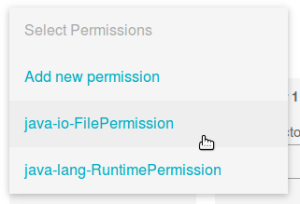 To set up permissions for a module, you have to log in as SuperAdmin and click on "Modules" in the left menu. Now choose a Module and a system for which you will apply those permissions. Use the select input field to add a new permission or choose an existing permission for editing. 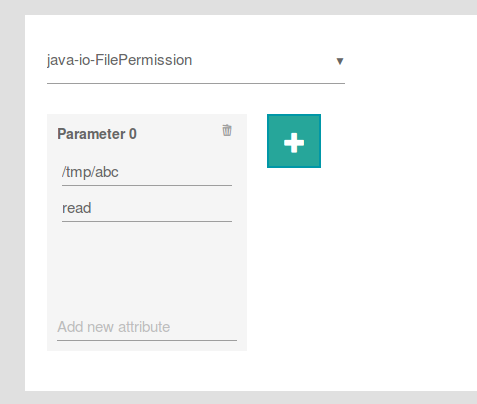 For adding a new one, you have to enter the name of the permission class and click on the "+"-button to add parameters for the new permission. If you're done editing, you have to click the save button. With the trash icons and buttons you can delete parameters and permissions. To remove an attribute you simply have to clear the specific input field.